7 This Melchizedek was king of Salem and priest of God Most High. He met Abraham returning from the defeat of the kings and blessed him, 2 and Abraham gave him a tenth of everything. First, the name Melchizedek means “king of righteousness”; then also, “king of Salem” means “king of peace.”3 Without father or mother, without genealogy, without beginning of days or end of life, resembling the Son of God, he remains a priest forever. 4 Just think how great he was: Even the patriarch Abraham gave him a tenth of the plunder! 5 Now the law requires the descendants of Levi who become priests to collect a tenth from the people—that is, from their fellow Israelites—even though they also are descended from Abraham. 6 This man, however, did not trace his descent from Levi, yet he collected a tenth from Abraham and blessed him who had the promises. 7 And without doubt the lesser is blessed by the greater. 8 In the one case, the tenth is collected by people who die; but in the other case, by him who is declared to be living.9 One might even say that Levi, who collects the tenth, paid the tenth through Abraham, 10 because when Melchizedek met Abraham, Levi was still in the body of his ancestor. 23 Now there have been many of those priests, since death prevented them from continuing in office;24 but because Jesus lives forever, he has a permanent priesthood. 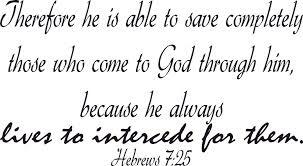 25 Therefore he is able to savecompletely[c] those who come to God through him, because he always lives to intercede for them. 26 Such a high priest truly meets our need—one who is holy, blameless, pure, set apart from sinners,exalted above the heavens. 27 Unlike the other high priests, he does not need to offer sacrifices day after day, first for his own sins, and then for the sins of the people. He sacrificed for their sins once for all when he offered himself. 28 For the law appoints as high priests men in all their weakness; but the oath, which came after the law, appointed the Son, who has been made perfect forever. This entry was posted in Discipleship and tagged Abraham, bearing witness, Bible, bible study, Catholic Church, Christ Jesus, Christianity, colossians 1, creation of the world, day god, deceitfulness, double edged sword, eternal salvation, faith in god, glory and honor, God, grace of god, heavenly gift, Hebrew, hebrews 6, high priest, Holy Spirit, invisible god, Israelites, Jesus Christ, jesus life, Judah, laying on of hands, left nothing, levi, levitical priesthood, life on earth, living god, lower than the angels, Moses, New Testament, Old Testament, order of melchizedek, patriarch abraham, plunder, public disgrace, religion, sabbath rest, solid food, Son of God, soul and spirit, theology, thorns and thistles, word of god. Bookmark the permalink.